Can torture be justified in exceptional circumstances? In this timely work, Michelle Farrell asks how and why this question has become such a central debate. She argues that the ticking bomb scenario is a fiction which blinds us to the reality of torture and investigates what it is that that scenario fails to represent. 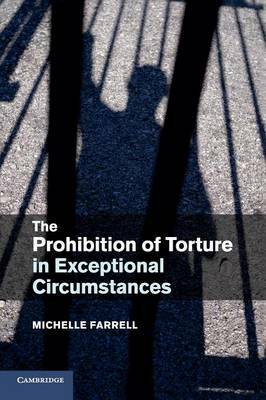 Farrell aims to reframe how we think about torture, and critically reflects on the historical and contemporary approaches to its use in exceptional situations. She demonstrates how torture, from its use in Algeria to the 'War on Terror', has been misrepresented, and appraises the legalist, extra-legalist and absolutist assessments of exception to the torture prohibition. Employing Giorgio Agamben's theory of the state of exception as a foil, Farrell deconstructs these approaches and goes on to propose her own theory of exceptional torture.